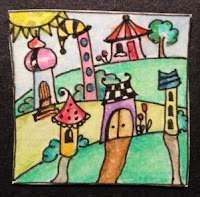 I so wish I had the time to make a whole page of little doodle houses and trees! Of course this is exactly why I love this particular challenge. It's only an inch, it takes very little time, so little that even on the busiest of weeks I can find the time for an inchie! Also even when I don't feel like drawing and I sit down to make an inchie anyway I end up relaxing and enjoying myself. When I'm done I am asking myself why on earth I didn't feel like drawing? The answer is probably that I was stressed out, which drawing is the perfect cure for! After the village I made a new inchie for week 2. 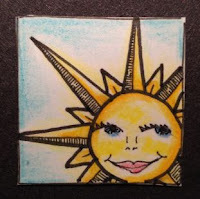 I wasn't really happy with the sun I made. This one I like better. Even though I messed up the eyes. Eyes are really tough! Really! I really love the amount of detail you got in both inchies, and I adore the sun, I have been looking for something like that to bead, so I love it. I love both of your inchies! A lovely little village, very colourful. Your sun is great. But I love your village inchie. 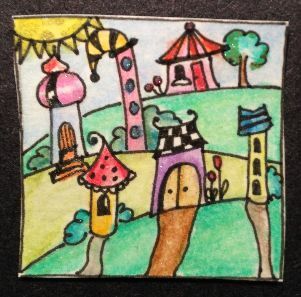 It's so much fun to look at the little colourful and playful houses.